A unique feature of propane is that it is not produced for its own sake, but is a by-product of two other processes, natural gas processing and petroleum refining. 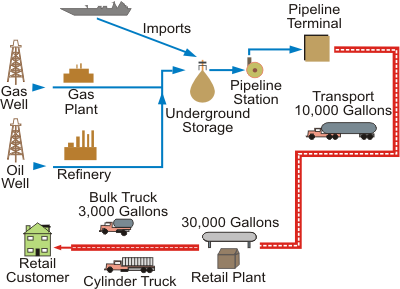 Figure 1 shows a diagram of where propane comes from and how it gets to the consumer. Natural gas plant production of propane primarily involves extracting materials such as propane and butane from natural gas to prevent these liquids from condensing and causing operational problems in natural gas pipelines. Similarly, when oil refineries make major products such as motor gasoline and heating oil, some propane is produced as a by-product of those processes. In addition to these two processes, demand is met by imports of propane (about 10 percent) and by using stored inventories.